Recipe: Eggplants stuffed with spice mixture and cooked on low flame to make a dry curry ! This is another recipe from my Tuesday sattvic cooking and is not a regular one since it is devoid of some ingredients that may or may not be used in a regular recipe. It is mildly spiced with goda masala and does not include garlic or onion and some other ingredients like asafetida, pepper corns, ginger. May be, I can have another post which includes the ingredients that have been left out for now. There are lot of different types of eggplants out there in the markets, but the ones traditionally used are small bulb shaped and are know as Indian eggplants in the markets here. These are the best ones to make the various stuffed recipes which are famous in regional Indian cuisine! The other similar recipes are Badane Ennegai from Northern Karnataka guthi venkaya kura, Bagara Baingan from Andhra and Rhengan Reveya from Gujarat! 2. Rinse the eggplants and slit them in crosswise manner with the stem side intact (see pic). Fill the eggplants with the stuffing mixture or the masala. The remaining stuffing can be used to top the eggplants. 3. Heat oil in a vessel, add mustard seeds and as they pop add curry leaves. Then add the stuffed eggplants and top them with the remaining mixture if any. 5. After the eggplants are cooked, remove from heat and serve with chapati/roti or rice. I feel the best way to eat it is with what we call Bhakri in marathi or Jolad rotti in kannada. Note: I prepared this dish to a very dry consistency and used very little water. If you need a curry or gravy like consistency add water. Cooked pigeon peas tempered with cumin seeds and simmered in coconut sauce! According to Ayurveda, India's classic medical science, foods are grouped into three categories – sattvic, rajasic and tamasic.One can find more information here. Sattvic food is that which is in the mode of goodness ie. clean, pure and wholesome. Sattvic foods include fresh fruits and vegetables, legumes, lentils, whole grains beans,unrefined flour, dry fruits, coconuts, cow’s milk, butter, ghee, cream, cheese, yogurt etc., but no onion and no garlic. For me personally, I fast on Tuesdays and its one meal in the evening. So whatever I cook on Tuesday evenings for prasad/naivedya has to be sattvic food. I prepared this curry which is a regular in my cooking and back home too this is a regular one. It is simple yet amazingly delicious in taste with the use of coconut, cumin and ghee off course. Vegans can use oil instead of ghee. 2. Grind the coconut, cilantro and 1/2 tsp of cumin seeds to a fine paste or coarse if preferred and keep aside. 4. Heat oil/ghee in another vessel and add cumin seeds. Transfer the cooked dal to this vessel, add the ground coconut paste. Add salt and bring to boil. Rice blended with mixed vegetables and spices ! Over the weekend, this is something that was prepared in a jiffy as I was not very keen on having to go out to eat. For me pulav is an easy and simple way of cooking up a lunch or dinner and have a good nutrition value attached to it. One of my acquaintances saw a picture on one of my recipe posts and said that I have been preparing special dishes such as pulav. Hmm, but for me pulav is not a special occasion dish, but rather a quick one pot meal and great way of having daily servings of fruits and vegetables. “Did I say five”, yes!, research and dietary guidelines recommend that we should have an intake of atleast five servings of fruits and vegetables on daily basis. Apart from soups, this is one dish that I prefer with lot of mixed veggies. So here is the recipe for the mixed vegetable pulao/pilaf. Other then the veggies mentioned here, one can go ahead and use any other that will be available! Serve the pilaf with raita or dal or any spicy curry. 1. Wash and soak the rice for 15 – 20 minutes. Drain the water and keep aside or drain when at step 7. 2. Heat oil or ghee in a deep and heavy bottom vessel. 3. Add the whole spices (cardamom, cloves, pepper, cumin seeds, bay leaf) and saute. 4. Add the onions and fry till they are slightly brown. 6. Add the vegetables and sauté or roast for couple of minutes. 7. Then add the rice and sauté or fry for 5 more minutes. 8. Add water, salt and bring it to boil on high heat. Let it remain on high heat for few more minutes till you see lot of vapors. 9. Cover the lid, reduce the heat to low and let it cook. Marinated chicken and potato cubes sauteed with kasoori methi(fenugreek) masala ! This is my version of methi masala and have no idea if there is any masala or spice mix as such. I actually wanted to saute the chicken in tandoori spice mix but while preparing the spice mix, excluded some spices and gave a twist to make it little different by adding in more kasoori methi (dried fenugreek leaves). Kasoori Methi is a herb, basically dried fenugreek leaves. It has a bitter taste but gives a nice aroma and flavor to the dish. Though most of the time, the fenugreek seeds are used in making the spice mix, I attempted to make use of the dry leaves as I have a packet full of this herb lying in the pantry for a long time. But the final dish was awesome and do give it a try. 2. Combine the spice mix(step 1), yogurt, ginger garlic paste, salt, potatoes and chicken and let it marinate for few minutes. 3. Heat oil in a large flat pan/skillet, add the marinated mixture and saute on high heat. Keep turning for 5 – 7 minutes. 6. Garnish with cilantro or coriander leaves or ideally with fresh fenugreek leaves! 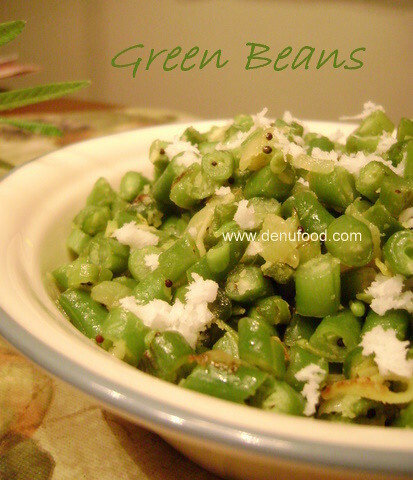 Chopped green beans sauted with tempered seasoning and garnished with grated coconut! “If all the ingredients in two recipes are same, but the taste differs based on shape of the cut vegetables” this was what on of our teachers had mentioned in one of the English classes while in middle school. And I was quick to agree to it because whenever mom prepared bhaji with eggplant vertically sliced, I used to love it rather than having it diced or cubed. It seems funny though !. And same with the green beans too. 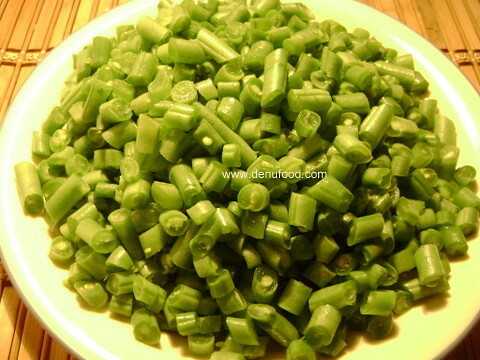 It even goes to the extent that the seasoning changes with the way the vegetables are cut. So with green beans, I prefer using green chilies and mustard if I have finely cut beans or else I use tomato and red chili powder if I just break them in three four parts. Ok so here is the green beans bhaji that I prepared yesterday and is a good side or to have it with chapati. Try this version of the beans and you’ll will enjoy this dish with a little seasoning that makes this vegetable a wonderful dish! I prefer having it little crunchy and therefore I just sauté it and not overcook as it will become soggy. 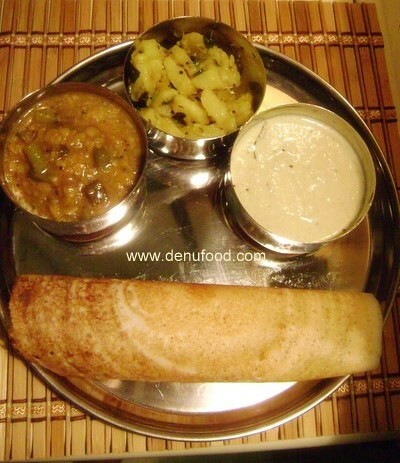 This is the famous Indian crepe and a masterpiece from the cuisines of South India. But not anymore, as it has traveled in all homes throughout India and outside too. If you would like to find the best dosas in a restaurant, then one should look for indian restaurants specializing in South Indian cuisine. They are made with rice, lentils and fenugreek seeds and is a good meal for anyone looking for a gluten free dish. 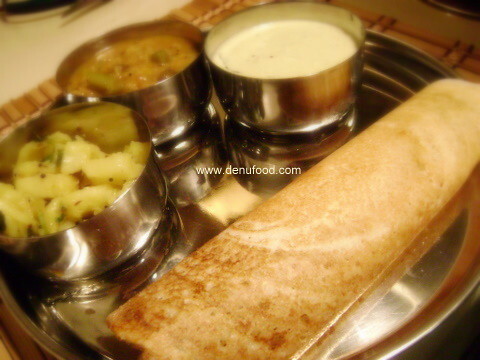 As kids growing up, I remember everytime we went out and had to eat outside, the only thing each one of us ordered was masala dosa, nothing else, just one used to be so filling.We had a family as tenants who were from Bangalore and thats when my mom got to know the recipes for making dosa or idlis. After that every weekend, it was dosa for breakfast, lunch and dinner. We were so much in love with it, that other lunch or dinner dishes did not matter to us kids. In the restaurants, you would get the crispy golden dosa filled with potato filling and don't be astonished to see it bigger than the plate. At home I make it in a smaller size and prefer to keep the potato bhaji on the side as seen in the picture. Thats because I like to eat more dosa and less of potatoes. Serve it with a coconut chutney and tangy sambar on the side. Amazingly Delicious !!!! 2. Grind the urad dal, rice, fenugreek seeds and the cooked rice or poha to a smooth batter. Use very less amount of water while grinding. Add salt and mix. 3. Leave the batter overnight to make dosas the next day. 6. Cook on both sides, if desired otherwise it is not required. 7. Serve hot with potato bhaji, sambar and coconut chutney. Note: Extra batter can be saved in the refrigerator for later use. This is my entry to Monthly Mingle (Brunch) and being hosted by Meeta over at What's For Lunch, Honey? Batata/Aloo Sukhi Bhaji (Potato Dry Curry) & Awards ! Boiled and cubed potatoes sauted with light spices! This is one of most versatile, easy, simple and widely prepared bhaji/subji in India, from North to South & East to West. There could be slight variations with seasoning or tempering. We had to have chapati if it was a potato bhaji, we used to call this pivli bhaji literally meaning yellow vegetable. Growing up, I always used to see mom preparing chapati or bhakri based on what goes as the spice seasoning for the vegetables not just potatoes but other veggies too. If green chillies are used for spice, then she made chapati, if red chilli powder is used, then she made bhakri. And now even I prefer it the same way. Apart from chapati, this subji goes well with puris, dosas, ghave, appam. We always had this on all the festive occasions(minus onions), for picnics, when we had guests and relatives...kinda universal ..had to have it on each and every occasion. I too made this, when we had some friends come over at our home, so you might find little larger quantities of ingredients. So do prepare it with lesser amounts. 1. Boil the potatoes in enough water. Once cooked, cool them, then peel the skin and dice into bite size cubes and keep aside. 3. Add salt and turmeric and mix. Immediately add the diced potatoes and mix properly so that all the seasoning and potatoes are well mixed. Stir until potatoes are all turned yellow with coating. 4. Sprinkle little water(2 tbsp) and close the lid and let it cook on low flame for few minutes so that the seasoning goes in well within the potatoes. 5. Garnish with cilantro/coriander, fresh grated coconut and serve with chapati/dosa/puri. * I've used comparatively more oil in the recipe due to our friends preference. Use less amounts if you prefer. This is my entry to Think Spice-Think Turmeric guest hosted by Sudeshna of Cook like a Bong, event by Sunita.Thank you Pavithra, Nivedita, Sanghi, Sadhana & Muskan for being newest followers on my blog. Also thanks to Sandhya for having passed an award to me. Thank You so much Sandhya for the appreciation.I am so delighted !! In one of my previous recipes posted here, I had used lot of veggies and half of all the bell peppers were lying in the refrigerator. So I had to use all those veggies and came up with this colorful salad sandwich. I have used very less amount of shrimps(small ones too) compared to veggies and one can easily add twice or thrice the amounts of shrimp. That will make the salad look more shrimpy! Also one can use different veggies other then those mentioned below. I was reading Joanne's post about mexican nacho pizza and I smiled to myself because I had this ready to post draft of a recipe which is the indianzed version of the italian recipe probably comes close to shrimp scampi, without the wine stuff. Its fun how we end up combining the flavors of different regions to suit our tastes or just out of necessity. Sandhya has passed on some wonderful awards to me which I am going to post them in my next post. Thanks Sandhya for being so encouraging! 1.Clean the shrimps, add salt and keep them aside till we get other things ready. Wash these once again later before adding to the pan. 2. Heat oil in a pan or large skillet. Add the minced garlic and saute for a minute or two. Add crushed red peppers, shrimps(washed/drained), salt, pepper powder,turmeric and saute for about 4 - 7 minutes till the shrimps are fully cooked. 3. Once cooked, add the lemon juice, mix it and remove the shrimps in a bowl. 5. Combine the veggies and the shrimps. Add any seasonings or any other raw veggies if required. 6. Serve it as a side or on a slice of bread to make a open faced salad sandwich. Note: If required increase the amount of shrimps to 3 cups. Thank You EC & Yasmeen for being newest followers of my blog. Manchow Soup used to be my favourite soup while in India. For those of you don't know what manchow soup is, it is a soup that you find in the fusion indo-chinese cuisine. After coming to US, I used to visit the chinese restaurants sadly to find out that they don't serve these. It was so funny at one of the restaurant lady mentioned to me "Mam, there is nothing known as manchow soup in chinese cuisine". I was so desperate to have manchow soup, this came as a sadness. No idea where the name of manchow soup came to India(I read that its a fusion recipe of some chinese settlers in india), but whatever..it does comfort the soul. This soup is not going to be any kind of manchow soup but is rather a mix of vegetable and some chicken. From last couple of years I have been avoiding anything that is made with soy and store bought sauces. So this is not going to be your average manchow soup. But if you are going to add some soya sauce, vinegar, chilli sauce and remove parsley, I guess it would definitely come close to it. Do your own addition and subtraction with the ingredients. 1. In a deep vessel, heat oil. Add the green chillies and ginger garlic paste and saute. 2. Add in the spring onions, chicken pieces and saute. Then add all the vegetables and saute. 3. Add water, salt, black pepper powder and bring to boil. I have not used any kind of broth here. If you prefer, use it instead of water in step 3. To get a thicker consistency, add paste of cornflour by mixing a tbsp of cornflour in water. Can add some instant noddles like maggie to it just few minutes before serving.